Tai Chi Instructors Marlene and Steve Renick demonstrate one of their moves. Tai Chi exercises benefit balance, coordination, reduce falls and relieve arthritis. MOUNT GILEAD — Marlene and Steve Renick have been students and teachers of Tai Chi for 16 years. They have been teaching for the Morrow County Community Center (MCCC) for four years and continue this fall with classes at Trinity United Methodist Church in Mount Gilead. Class participants appreciate the health and healing benefits of Tai Chi. Anne Cotton says the exercises and movements are good for increasing strength and mobility. It is especially good for those who have problems with joint pain or arthritis. Marlene Wrenz said the class helped her regain strength after knee and hip surgeries. When she began classes several months ago, she needed to do the exercises sitting down in a chair. Now she is able to do the exercises standing and just keeps a walker close by. Some other benefits are balance, coordination and reduction in falls, arthritis relief, physical therapy and rehabilitation, relaxation and overall fitness. It is also recommended as an exercise for diabetics. Renick said she and Steve teach the “basic Qigong movements” which are more therapeutic. They also teach the “Yang” and “Sun” forms and certified to teach the Arthritis Foundation’s form of Tai Chi. The Renicks describe Tai Chi “like slow motion karate” or swimming in air.” Movements are controlled, balanced and slow with low-impact on feet and legs. Marlene has seen the health benefits herself and said that many studies show that tai chi offers both physical and mental benefits. While it is good for older people and even the very old, it’s also a great accompaniment for the young with aerobic exercise and weight training. Tai chi chuan originated in China centuries ago as one of the martial arts and values tranquility and reflection. There are no longer any martial elements for most teachers. It is now more a combination of a workout with dance movements. Classes are on Mondays from 12:30 to 2 p.m. and Thursdays 6 to 7:30 p.m. Classes are held at Trinity Church at 75 E. High Street in Mount Gilead. 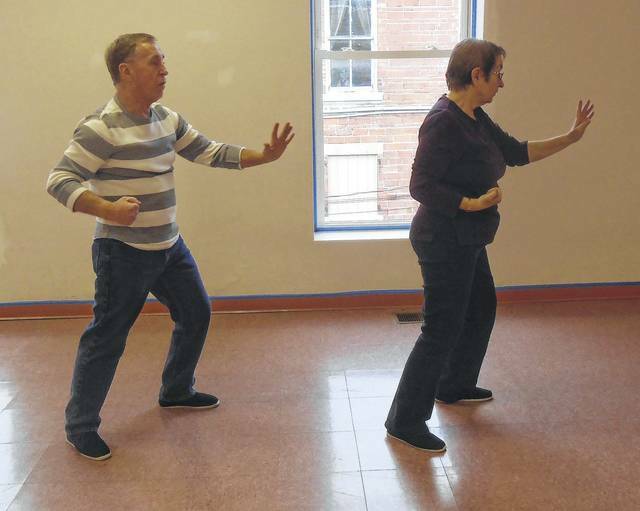 https://www.morrowcountysentinel.com/wp-content/uploads/sites/29/2017/09/web1_Tai-Chi.jpgTai Chi Instructors Marlene and Steve Renick demonstrate one of their moves. Tai Chi exercises benefit balance, coordination, reduce falls and relieve arthritis. For information on fees or Morrow County Community Center an exercise center at 16 S. Main Street in Mount Gilead, call 419-947-2100 on the web at www.mccommunitycenter.org.